As us big city folks pine for spring, we're starting to plan our summer vacations. As friends consider rentals in the Catskills, the Berkshires, Cape Cod, Muskoka and Prince Edward County, my family and I are starting to plan our retreat to Nova Scotia. And here's why I think you should too. Most city folks will book a summer home within driving distance. But here's the thing - driving in and out of the cities like NYC, Toronto, Montreal and Boston - particularly during the summer - is a nightmare. Especially with babies or toddlers in the car. When our daughter was two months old, my husband and I decided to book a weekend getaway out of NYC to the Catskills, which according to Google Maps, was a mere 3 hour drive away. The trip took seven hours, and included a stint in a suburban WalMart parking lot after dark, frantically and maniacally trying to bounce and soothe our banshee screaming baby under florescent streetlights. On the way back, we hit construction and missed the on ramp to the George Washington Bridge. If you're from NYC, you already know how it went - another seven hour trip, with clenched jaws, white knuckles, two of us crying, and lingering PTSD. In general, babies and toddlers hate sitting in a car seat in stop and go traffic. I know mine does. My kid also won't sleep in the car if there's traffic. I will opt to fly rather than drive with my child any day of the week. We've been on 28 flights with our 20 month old, and every single flight has been easier and more enjoyable that our car trips. During the summer months, Halifax, Nova Scotia offers several direct flights from major Canadian and US cities, with flights from Toronto, Boston, and New York City clocking in at two hours (Montreal is a mere 90 minutes). And the Halifax airport is a breeze. No construction, no snaking taxi lines, no pollution and honking as you step outside. A relatively small airport by big city standards, you can be off the plane and out of the airport within 10 minutes, where you will be greeted by ... silence. Mmmmm. When I returned to Nova Scotia with my 13 month old, I almost wept. I forgot that airports could be so easy. Expect to open your wallet wide for a summer rental within driving distance of the east coast's big cities. Weekly rentals in hot spots like the Catskills, the Berkshires, Cape Cod, Muskoka, and Prince Edward County can easily set you back $5-10,000 USD. While many Nova Scotia home rentals are more modest than the flashy architect-designed 12 bed jumbo rentals of the above mentioned vacation regions, if you're looking for some peace and quiet; a beautiful waterfront view; and a place to escape with your little brood, you'll find much more affordable digs in Nova Scotia. For Americans, your dollar goes even farther. As I'm writing this, the exchange rate is hovering around $1.30 CAD to $1 USD. Nova Scotia can be driven from tip to tip in approximately 8 hours. If you're looking to restrict your time in the car, there is plenty to discover within an hour of Halifax. The city of Halifax has a lovely waterfront, delicious restaurants, cool playgrounds and great festivals sure to appeal to parents and little ones alike. Two of my favorite festivals are the Halifax Busker Festival in early August and the arrival of the Tall Ships during their annual regatta. Within a short drive of the city are lovely beaches and quaint sailing towns like Chester, Mahone Bay and Lunenburg. And though folks often think of the ocean when they think of Nova Scotia, the province also boasts hundreds of lakes, many of which surround the Halifax area. The ocean certainly has its charms, but when vacationing with babies and toddlers, the calm lake waters can be more welcoming for little ones. There are plenty of lakefront communities with summer home rentals within a short driving distance of the city, so you don't need to choose between an urban or nature experience. You could have accommodations on the water and do day trips into the city (or vice versa). Don't miss out on the Annapolis Valley. The agricultural region is a mere hour from Halifax, and boasts a lovely wine region, stunning views, and U-pick farms. Relax and enjoy the beauty and solitude while your children can run free through vineyards or on the ocean floor during low tide. Luckett Vineyards and Domaine de Grand Pré both have wonderful views, plenty of vineyards for your little one to explore, and delicious restaurants. Unlike back home, Nova Scotia doesn't have much traffic. You won't find yourself in gridlock as you venture to any of these destinations. It was in Nova Scotia that my husband and I discovered that our daughter actually will sleep in the car, provided that we can hit the open road. Talk about a game changer. We were able to time our travels to her naps, and enjoy relaxed scenic drives while she slept peacefully in the backseat. She sleeps in the car seat! Nova Scotians are ridiculously friendly, and will give you the shirt off of your back. When friends from out of town visit, they always ask "Do you know that person?" as strangers nod and say hello. Nope - that's just Nova Scotians being friendly. Nova Scotia has a lot to offer a young family looking to recharge and relax in a beautiful waterfront setting. 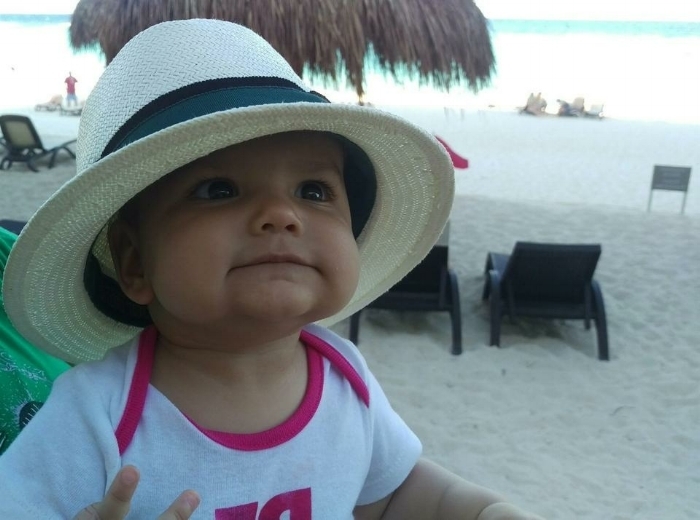 Over the next several months, The Littlest Passport will profile itineraries and accommodations for an unforgettable vacation with your baby or toddler - stay tuned! And if you have questions and recommendations, please reach out via our contact page.